At the outbreak of the Civil War, Major John Adams Halderman (1833-1908) helped recruit and then lead the troops of the First Kansas Volunteer Infantry Regiment, who saw considerable action at the Battle of Wilson's Creek (August 10, 1861), near Springfield, Missouri. This folder contains a series of letters for the years 1860-1862. Included in this correspondence are letters from Governor Charles Robinson, among others. Some of the letters focus on the defense of the border between Kansas and Missouri. 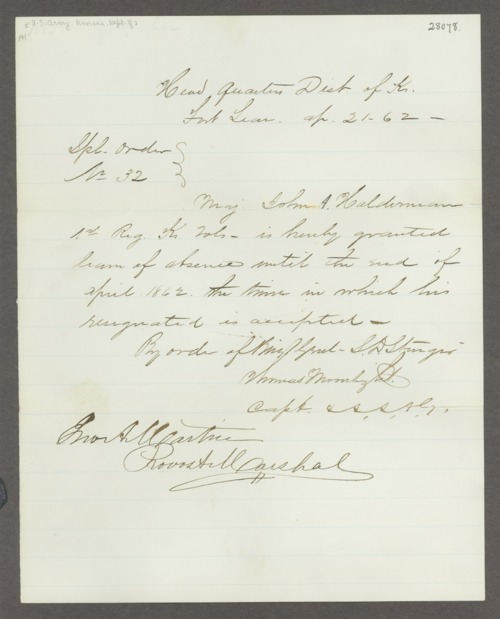 Collections - Manuscript - Halderman, John A.